Launched at the British International Motor Show at the NEC in October 1992 to celebrate the 30th anniversary of the MG B and to keep the MG name alive for the revival of the marque, the RV8 was destined to become a classic. All the features of a classic sportscar were there - retro looks and open air motoring with the comfort of a luxurious finish with the very comfortable and supportive Connolly leather seats, elm burr trims and dashboard, plus of course the sheer pleasure of a V8 engine. Only just over 2000 RV8s were produced and surprisingly 80% were exported to Japan. The new MG - codenamed ADDER - was developed by a Rover Special Products team at Gaydon based on the MGB Heritage bodyshell produced at the Faringdon plant with subtle bodywork modifications and a luxurious interior. Under the bonnet the RV8 was powered by a 3.9 litre aluminium Lucas fuel injected V8 with a modern engine management system delivering 190bhp at 4750rpm through a five speed gearbox and a Quaife differential. Telescopic dampers replaced the original lever arm units but the faithful live axle remained. The new model had a lower, sleeker appearance through a clever combination of suspension and evolutionary styling changes whilst still maintaining the unmistakable character of the classic MGB. The retro links with the MGB, the bestselling sportscar of all time which ceased production some 13 years earlier, are clear, but that familiar MGB appearance with subtle styling changes hides the reality - the RV8 was a very new car. 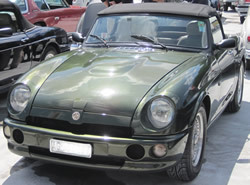 Although the RV8 was conceived and designed to use existing MGB parts as far as possible, the surprising fact is the car contained barely 5% of the original components. Most of the parts, including the engine, gearbox, back axle, electrical systems, body and internal trim were either totally new or adapted from raiding every Rover parts bin the RV8 project engineers could lay their hands on at the time. Reflecting on the RV8 project in 2003, John Yea (who had worked at RSP as project manager) commented "I don't think a retro type car built in an old bodyshell will be seen again - manufacturers don't keep the tooling any more, it's just binned and gone for ever!" Timing was a factor for vehicle conformity - John Yea noted "another six months or so and the RV8 might not have met the increased "drive by" noise limits - it was that close! Projects like that just don't happen like that anymore". The RV8 was aimed at well heeled "driving" enthusiasts who had always wanted a classic British open top sports car to drive for pleasure" and priced at just under £26.000. The press reaction to the RV8 in 1992 was one of puzzlement and although Rover had made a point of emphasing the car was not intended to compete with more modem sportscars, several reviews tried to compare the RV8 with the modern V8 powered TVR Chimera. Today the RV8 is an increasingly popular classic car with its modern engineering updates, a luxury internal finish and a bodyshell with vastly better rust proofing than the earlier MGB models. A flow of cars from Japan has increased the availability of the model in the UK and also in Europe and overseas. Good servicing and spares support is available in the UK from two "full service" specialists and also through a specialist in Australia where the model is also very popular. A key feature of the RV8 market is the exceptionally low mileages of many cars with 20'000 to 35'000 miles not uncommon, but other than a few high prices touted by "top end" traders for very low mileage examples, current RV8 prices are simply exceptional value for this classic MG.